Tempered glass mosaic, float glass, glass cutting, collage, coloring grout, adhesives, substrates! It's all here! 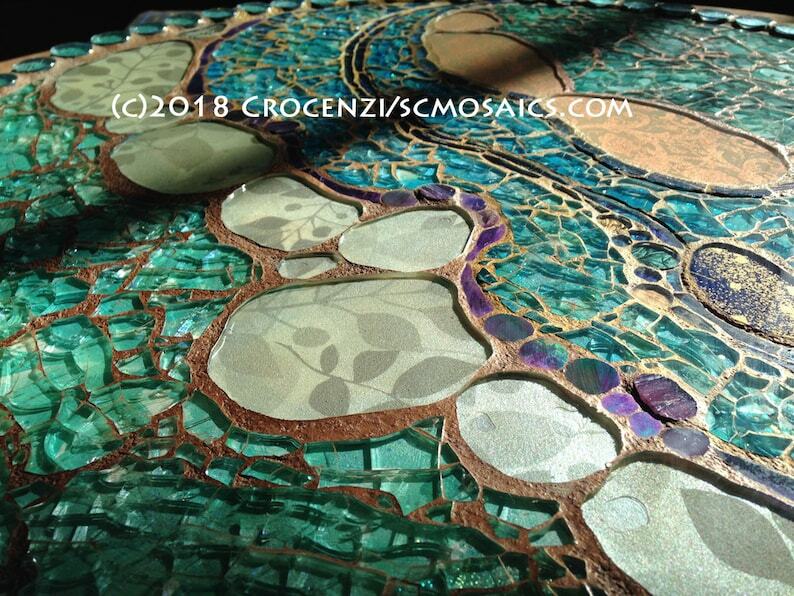 The tempered glass mosaic technique offers anyone, regardless of experience level, an absorbing set of skills that will give you hours of delight and satisfaction as you build artwork that is intriguing, colorful, and glimmering! You will use an array of supplies that are easily acquired at your local craft supply, and hardware store. Glass is also easily acquired by salvaging cast-off pieces, or purchasing it new. I've taken my ten years of working with tempered glass mosaic and created a 33 page tutorial. And, while I admit to being a major TG geek (I mean, who else can talk about glue for 5 pages? Ha! ), I have made every attempt to make this an accessible, brief but thorough, detailed but readable tutorial. It covers many topics like glass and where to buy or salvage it, substrates that you can glue glass to and how to prep them, a huge array of colorants, including alcohol inks, that can be used, basic glass cutting, adhesives, images, bling, grout, grout colorants, and how to change the look of cured grout with a color/glimmerwash. Would you be surprised to learn that all of the pieces pictured here were created with transparent colorless glass? Yes, it's true! At least 90-100% of them were made with salvaged tempered and float glass. This tutorial will show you how, step-by-step! Not only will you find step-by-step instructions, you will also get a glimpse into how I created many of my pieces. Tips and tricks developed over the decade that I've been immersed in this technique are invaluable; a rare glimpse into my design goals, and how I went about achieving them. I printed the tutorial so that I could include photos of it in this listing, but what you will receive is a .pdf file that automatically downloads to your computer. It looks exactly like it does in the photos, except it will be on your computer screen. 1a.) Recently added 8 more videos that show the various ways in which I use alcohol inks. 2.) You will be able to view these videos in our very own private Facebook group! Besides viewing the videos, you will also be able to post questions and comments for me and your fellow groupmates to answer as well as post pics of your works-in-progress in a safe and supportive atmosphere. I'm so looking forward to this, as it is the first time I've been able to stay in contact with students, coaching them as they progress through the technique. The group will last indefinitely so don't worry that you won't have time to view them as many times as you want. Once you purchase the tutorial, go to Facebook and find our group (use the search box). It's called Susan's Tempered Glass Tutorial Group. Request to join it, and once I verify that you purchased this tute, I will approve your membership. You are not required to post anything there. You can simply view the videos and read the comments, questions, and answers at your convenience. If you have any questions, just drop me a note! I have been following Susan's amazing mosaic creations for ages and was so sorry I lived in Australia and couldn't get to her workshops. When I saw the offer of an on line tutorial I signed up immediately and am so happy I did. The tute appeared immediately and provided clear instructions presented in a fun and easy to follow format. I have learned so much and appreciate Susans speedy responses, ideas and encouragement. I'm hoping for further tutes especially incorporating polymer clay. Thank so much Susan. There is a lot of information in this tutorial. I have not made my way though all the videos, but the facebook group is an amazing resource for constant feedback with projects! I've been doing mosaics for over 10 years (mostly self taught), and still found all of the information extremely useful! I highly recommend! This is a very concise and thorough tutorial. I have learned so much and created a beautiful piece of art by following Susan's instructions. The support is wonderful and helpful. If you work with mosaics already you will learn some wonderful new tricks or if you are new to the art form this tutorial will have enough detail to move you right along. I am so glad to have had the chance to take a class online from Susan. Using tempered glass in mosaics is something I've always wanted to learn from her. The videos are very easy to follow, as she demonstrates exactly what she is teaching; she has an excellent voice--easy to listen to, and easy to watch. I can watch the videos anytime and at my own pace which makes it nice. If I want to review something over and over, I am able to do that too. The course is easy to access through Etsy, which I had never experienced and found it to be good. Susan is very responsive to questions and is always happy to help; she REALLY is a good teacher. I would highly recommend this class to anyone interested in mosaics and in learning how to use tempered glass.